The Aquarium Microscope and The Micro-aquarium. A Perennial Source of Amusement. The Aquarium Microscope and The Micro-aquarium. A Perennial Source of Amusement. William James Wintle (circa 1910). 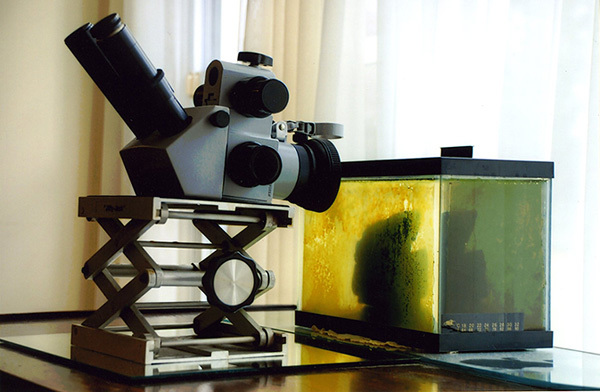 Microscopists have had a centuries-long relationship with the micro-aquarium (figure 1). First, I’ll describe my micro-aquarium that may be better called a micro-pond, and discuss a few of the many types of life that can be seen. Then, I’ll move to describe the microscope I currently use for observing life inside my micro-pond and along the way, I will briefly mention the work of the pioneers of the Micro-aquarium. Figure 1. The basic idea for indoor microaquaria as presented by Scherren in 1904. Scherren (1904, p. 172) considered that the micro-aquarium should provide “... the best means of preserving our stock of minute animals under conditions that will enable them to breed freely, so as to afford pretty constant supply of objects for microscopic examination.” I would add that it should also allow a microscope to be used to observe its inhabitants alive and undisturbed in their environment. My micro-aquarium is a small fish tank with a capacity of one gallon (approx. 4 litters) with flat glass walls. It is kept indoors year around, in front of a window facing East. There are plastic aquaria of similar size but I find glass easier to clean when the algae population attached to the wall has grown to the point of interfering with clear vision. Flat walls are desirable as they do not distort the view. The choices of what water to use to stock the little aquarium are near limitless. I use preferentially water samples from a large, local pond, Deep Pond, Mendon Pond Park, Monroe County, New York State. 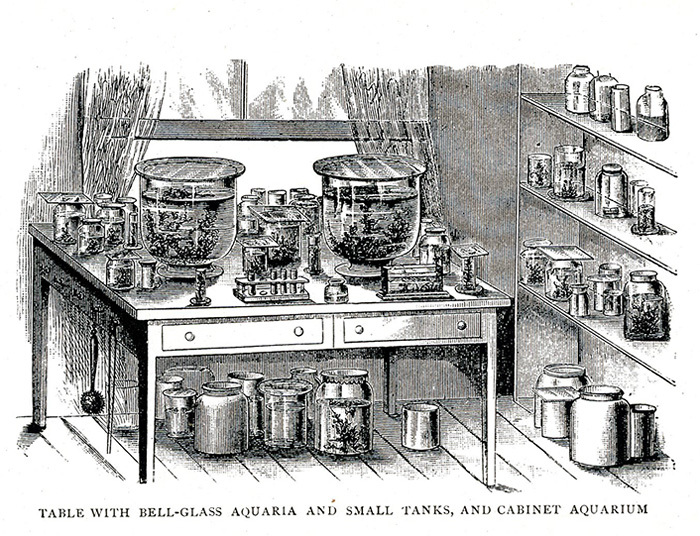 This probably, justifies calling my non-fish fish tank a micro-pond although the term micro-aquaria has long been in use (Wintle, circa 1910). Besides the water this micro-pond contains only a few rocks and some water plant taken from the same spot as the water sample. I use no air pumps, heater, or permanent light source. The few times that I observe at night, a strong flashlight placed above the tank provides sufficient illumination. Temperature of the house, and of this room in particular is about 75º F (24º C) during the day year around, and slightly less at night. Transient temperature changes, or sunlight falling on the aquarium through thin curtains, don't seem to affect the residents in any visible manner. As for food, it appears that left unattended the micro-pond is self-sustaining, certainly the hydras when present love to ingest ostracods. I do, just in case, provide minimal amounts of fish food once a week. If the food is in the form of floating pellets, one often sees planaria fast gliding over the glass wall towards the pellets. Scores of ostracods also come to feed on the pellets. I carefully avoid over-feeding the tank as this may foul the water and bring havoc to the system. There is little evaporation because I cover the micro-pond with a glass plate that only leaves a free gap of about 3 mm for gas exchange. Whatever evaporation takes place is taken care of by the periodic replenishing with either pond or fish-tank water, but never tap water. In summary, the care required by the micro-pond is minimal, and yet it provides living materials for microscopic observation year around. It makes “the freshwater microscopist largely independent of season and weather.” (Garnett, 1965) and it allows following the changes in the various populations of micro animals that take place even under these highly stable conditions. Currently, I use a LOMO MBC-10 stereomicroscope removed from its base and placed horizontally on a chemistry stand (figure 2). The advantages of this set up which I consider ideal are the sharp, wide field of view provided by the microscope, the long working distance that allows comfortable placing of the instrument and its base, and the option to change magnification from 8x to 56x. One of the oculars has a pre-calibrated micrometer so that I can readily measure an object of interest happens to appear. The fact that the ocular tubes are set at 45º means that although the body is placed horizontally one looks through the oculars in the usual manner (no need to bend up one's neck). The objective looks head-on at the aquarium glass. For my observations, I have a strong preference for the 16x combination obtained by the use of the 2x objective in conjunction with the 8x/23 wide-field oculars. The balance of magnification and field size makes it perfect for both searching and observing. The adjustable stand rests over a 26 x 12 inch glass plate (a surplus from the hardware store); it allows moving the microscope vertically. The glass surface underneath allows displacing the microscope and its base sidewise to search for objects of interest, or back and forth for focusing. It is remarkable how tolerant the microscope is for operating at this magnification to the fact it is focusing through a 1 mm-thick plain glass wall. Figure 2. The LOMO MBC-10 stereomicroscope. I have described above the set up I presently use and find more convenient for observing the type of “pond life” interest me more at this time that is to say, freshwater invertebrates. My favorite “searching ground” is the water-air interface as seen just across the glass wall. Many forms of life are present and easy to observe. 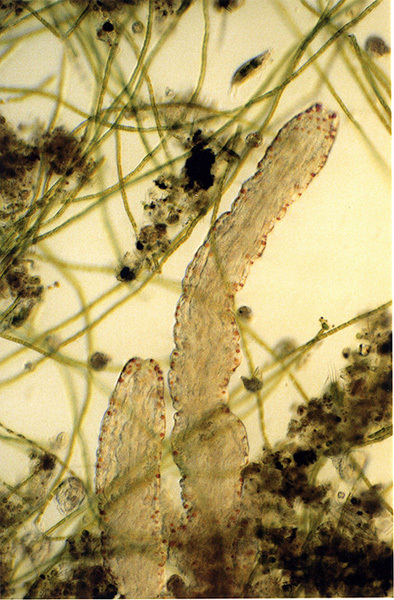 There are invertebrates of many types, rotifers, mites, hydras, cyclops, ostracods, occasional insect larvae, caddis-worms (which are not worms, but also insect larvae), and among the plants the duck weed Lemna minor, and the ubiquitous Wolfia arrhiza (Reid, 2001. Figure 3). What is beyond this magnification level for the most part, are any fine details of the structure of protozoa and most of the single-cell algae. Large protozoa appear as whitish specks of matter moving at various speeds. Some of the unicellular algae are distinct enough to be identified at 16x with good illumination (example Closterium) but that is all. The temptation to switch to higher magnifications is promptly checked by the realization that what one gains in magnification one loses in field diameter, in light intensity, and in general convenience of operation. In a word, for work at higher magnifications, the way to proceed is to take a sample using the view offered by the stereo microscope if possible, and to examine it further under a conventional transmission microscope (figure 4). The important point is how much can be seen with just 16x if a steady set up and good illumination, transmitted light in this case, are provided. Although very satisfactory for visual observation, my current set up suffers from the fact that I cannot easily record photographically what I see through the binocular head. A partial remedy, which I have used so far is to have a Nikon 6006S film camera mounted on a table-top tripod and fitted with a 65 mm Micro Nikkor lens. A 1.6x Nikon tele-extender and a 31 mm extension ring connect the lens to the camera. That set up was used for the picture in figure 3. However, it is not ideal and I hope eventually to attach a digital camera to one of the binocular tubes following the design shown by Ted Clarke (2007). Figure 3. The air-water interface adjacent to the micro-pond wall. At this point capillary action forms a water film that extends about 2 mm above the water surface. This area is a favorite feeding ground for microscopic worms (W) and ostracods (O). Myriads of Wolfia arrhiza (A) float on the water surface; one on the left shows the typical division by budding. The worm to the right moved during the relative long exposure (1/8 sec) but by a happy coincidence it serves as an internal marker to the picture; it is almost exactly 1 mm long. Figure 4. Photomicrograph of living Aelosoma worms harvested from the micro-pond and observed by conventional bright microscopy. The objective used was a 20x Olympus plano-apochromat, the ocular was a photographic 3.3x. Aelosomae have negative phototropism. Operating without a microscope flash, it was necessary to search and focus with minimum light intensity. Then the camera shutter was triggered using a 5 sec delay. At this point the light intensity was switched to maximum; the camera operating in an aperture priority mode selected a very short exposure time although not short enough to freeze the movement of the protozoa (Euplotes?) that appears at the top, slightly to the right. The typical orange pigment granules of the Aelosoma and some of the internal organs are clearly visible. Original magnification circa 200x. Many other microscopes of all types can and have been used as aquarium microscopes. Some time ago a person asked to an on-line Yahoo 'Microscope hobby' group whether a slit lamp microscope as the used in the clinical examination of human eyes could be used as an aquarium microscope. Indeed it could! Actually, the magnification range of the slit lamp is about the same as that of the LOMO stereo. This is not surprising since the “slit lamp” is nothing but a horizontally mounted stereomicroscope assisted by a sophisticated illuminator that features (among others) a slit diaphragm. My advice to anyone starting this form of microscopy is, try any microscope you can adapt to horizontal use; if it works for you it is fine. Before having the LOMO binocular, I used a British RAY binocular that was originally the focusing microscope for a Siemens A1 electron microscope! (Figure 5). Of course, the stereomicroscope with its rightside upside up images and correct left-right image orientation makes the task easier, but here anything goes! Can a regular monocular microscope be set in a horizontal position and used as an aquarium microscope? Of course! As a Google search shows, during most of the 19th century makers in the USA, England, France, Germany, provided monocular bodies adapted to aquarium observation. The excellent microscopy book by Nachtigall (1995, p. 118) illustrates a modern version of the theme. With a conventional microscope one sees an image that is reversed left-right, and upside-down. It takes some time to get used to see objects sinking toward the room ceiling, but it works. 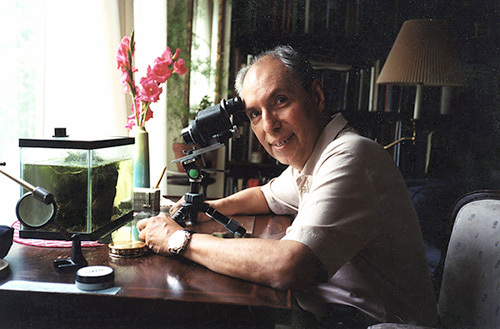 amateur microscopist by the name of Abraham Trembley used micro-ponds, many of them, for his studies on the biology of hydra (figure 6). It is an inspiration to read Trembley’s work (Lenhoff and Lenhoff, 1986). His experiments, for he was much more than a mere observer, included extensive application of quantitative biology and microsurgery. Let’s remember that his major work was published in 1744! Trembley is recognized as the Father of Quantitative Biology, he is also the likely Father of the Micro-aquarium. Figure 6. Abraham Trembley was tutor of the children of Count Bentinck, in Sorgvliet, near the Hague, Switzerland. 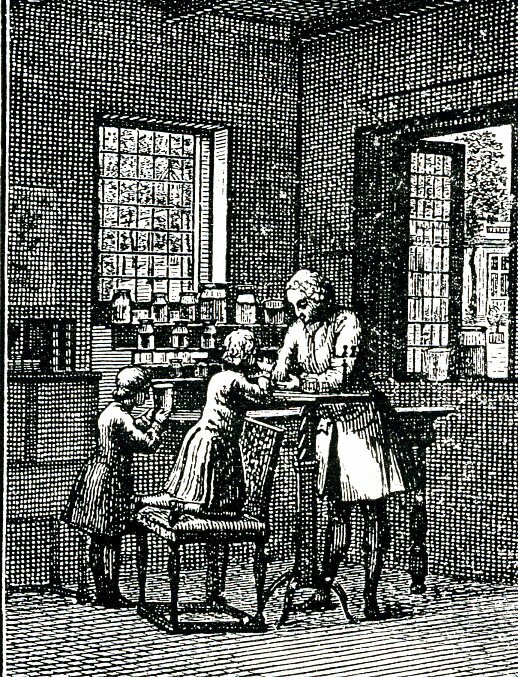 He is shown here with his pupils; notice the child at the left looking into a micro-aquarium while several micro-aquaria are placed by the windows (from Scherren, 1904). • Clarke, Ted (2007) Using an Olympus E-330 DSLR with a binocular stereomicroscope. Micscape, #136, February Issue. • Garnett, Wilfred J. (1965) Freshwater Microscopy. 2nd Edition. Constable & co. Ltd., London, p 2. • Lenhoff, Sylvia G. and Howard M. Lenhoff (1986). Hydra and the Birth of Experimental Biology - 1744. Abraham Trembley’s Memoires Concerning the Natural History of a Type of Freshwater Polyp with Arms Shaped Like Horns. The Boxwood Press, Pacific Grove, CA, pp. 188. With copies of the original illustrations, including folding plates. • Miscape Archives (1995-2007) are a rich source of information on all matters related to fresh-water biology. • Nachtigall, Werner (1995) Exploring with the Microscope. Sterling Publishing Company, NY, p. 118. • Reid, George (2001) Pond Life. St. Martin Press, NY, NY, p. 57. • Scherren, Henry (1904) Ponds and Rock Pools. With Hints on Collecting for and the Management of the Micro-Aquarium. The Religious Tract Society, London; 3th Impression, pp. 208. • Wintle, W. James (No date, but circa 1910) Recreations with a Pockett Lens. John Ouseley Ltd., pp. 179. Published in the April 2007 edition of Micscape.